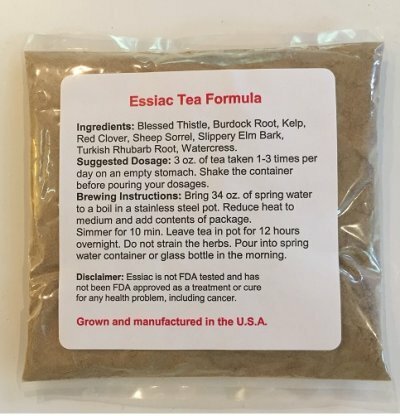 Did Essiac Tea stop my cancer from growing? It was recommended by a friend seven years ago and I have been doing the maintenance dose for most of that time and have several friend that are now taking it. For me it has helped greatly with hay fever during the bad seasons. I can tell that I feel much better, also. Twenty years ago I made homemade Essiac Tea for my daughter to drink because her doctor said she had pre-cancer cells on her cervix. One month later her doctor said there was no sign of cancer. Since then I have taken it as a preventative and have purchased ready made tea from many suppliers over the years, but none compare to the quality sold by Gina and Bryan. 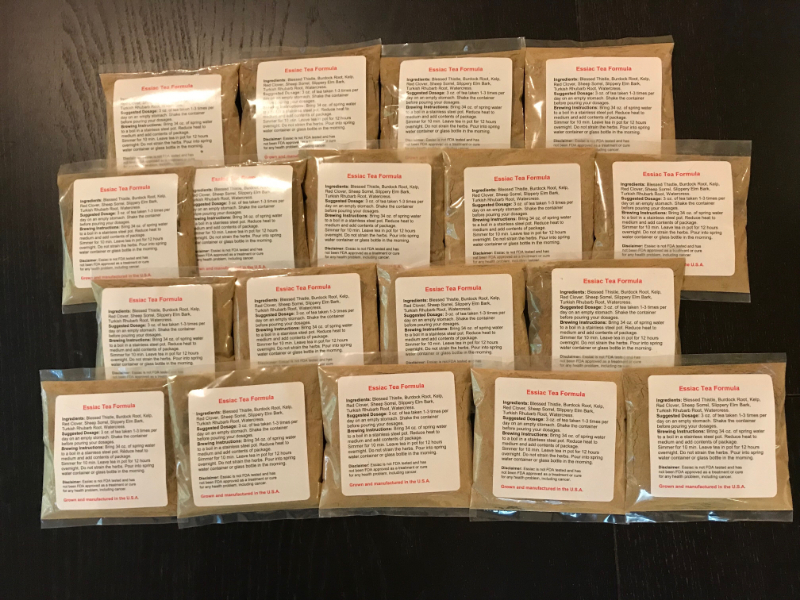 The ingredients are in the correct proportions and all are finely and uniformly ground to expose the most surface area of each herb or root. It is my opinion that this is the highest quality Essiac on the market today. As another testimonial, my minister's wife was dealing with her fourth recurrence of cancer and was facing new rounds of chemo and radiation. I told her that Essiac prevents and cures cancer by killing not only the tumors but it kills the cancerous stem cells that the tumors send out to float throughout your body, unlike chemo and radiation which only kills the tumors, leaving behind the untouched stem cells to cause the cancer to come back after 5 years or so. This is why doctors will never say you are cured of cancer, just in remission, because they know neither chemo or radiation kills the cancerous stem cells. She ordered the tea immediately and started drinking it every day. when she went back to the doctor about 6 weeks later, her markers had changed drastically and the cancer was clearly going away. A few months after that there were no signs of cancer. Gina and Bryan's tea is of the highest quality, which is why it gets results. I highly recommend it.